TAMPA, Fla. -- University of South Florida students already have been enjoying the benefits of the brand-new science building on campus, and on Tuesday, Sept. 27, 2011, the public will get a glimpse of the latest addition to USF when the university commemorates the opening of the Interdisciplinary Sciences Building. The ribbon cutting ceremony will begin at 4 p.m. in front of the main entrance. This new building is home to interdisciplinary research and state-of-the-art teaching labs for students in physics, biology and chemistry. 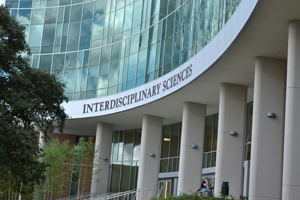 USF System President Judy Genshaft and College of Arts and Sciences Dean Eric Eisenberg will be on-hand to officially introduce the largest academic building on campus. Following the ceremony, guests will be treated to light refreshments and a tour of the building. At 238,500 square feet, the ISA building includes two 300-seat auditoriums, classrooms and research labs for the physics, biology and chemistry departments. The seven-story building makes it possible to teach more than 15,000 students per semester, serving undergraduate non-science majors, science majors and graduate students. The ISA will serve as a unique combination of shared facilities for biological, physical and chemical diagnostics and characterization, including shared scientific instrument design, building and repair facilities. More than 150 interdisciplinary research scientists and 100 doctoral students will collaborate on a variety of pressing issues, such as finding a cure for antibiotic-resistant bacterial infections, creating renewable and clean energy, developing new cancer treatments through nanomedicine, looking for new treatments for Alzheimer’s disease, and advancing the next generation of sensor technologies.